Finding Medieval York's Secret "Snickelways" and "Ginnels"
Walk York's secret passageways and you'll find a medieval world hiding in plain sight. Before we arrived in York, we'd read about the Barley Hall - a recently discovered medieval townhouse that had been lost in the middle of the medieval city of York. How on earth can you lose a building in a city as small as York? The fact is, this gem of a city has so many medieval treasures and so many twisting lanes and alleys that it is really possible, to simply lose one or two of them. The only way to really find Medieval York is to plunge into the snickelways and ginnels of this ancient city. A York friend tipped us off about an amazing little book: A Walk Around the Snickelways of York, by Mark W. Jones, which explained it all. Author Jones actually created the term snickelway in the 1980s by blending snicket - a passageway between walls or fences, ginnel - a narrow passageway between or through buildings, and alleyway - a narrow street or lane. Now local people in York use the word as if it is as old as the city of York itself. Armed with a copy of Jones's book, we headed for Bootham Bar, one of the entrances through York's ancient walls. The gateways through York's walls are called bars and Bootham Bar is the oldest, marking a nearly 2,000 year old Roman way into the city. Travel Tip If you visit York before the end of March 2018, stop in at the Barley Hall to see The Power and The Glory exhibition about York in the time of Henry VIII. The exhibition features six sumptuous costumes from the BBC's acclaimed series, Wolf Hall. They've even created a perfume for the event based on scents in use by the Tudors. It's called, if you can believe it, Decapitation. It was inspired by Henry VIII's fifth wife, Catherine Howard, who, as you might have guessed, lost her head. 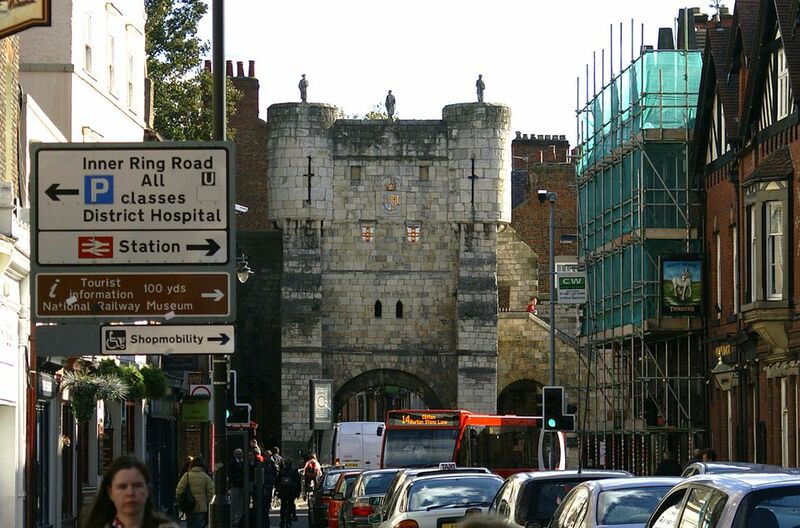 In the medieval, walled city of York, streets that lead to openings in the city walls are called gates. The entrances through the walls are called bars. Here, High Petergate winds into the center of the city from Bootham Bar, one of the oldest entrances to York. About mid-way up the street, on the left, the round sign announces The Hole-in-the-Wall Pub. Beside it you will find one of York's many snickelways. Little Peculiar Lane, just before the entrance to The Hole-in-the-Wall Pub, is a real hole in the wall. It may look like a private passage to someone's back door, but it's a public way and one of York's many mysterious passages, called snickelways. The view, once you've plunged through, is one of the best in the medieval city. Little Peculiar Lane is actually a ginnel - a passage through a wall or building - rather than a snickelway - a narrow passage between buildings. But never mind the terminology, just plunge through it. It's one of the oldest passageways in York and opens onto a snickelway known as Precentors Court where you'll be treated to a stunning view of York Minster. The 1,000 year old cathedral, built on Roman, Anglo-Saxon and early Norman foundations, is 200 feet high. It is the largest consecrated Gothic space in Europe and one of the Seven Wonders of the UK. Its west facade is magnificent, but do walk around to see the east facade and the Great East Window, famously as big as a tennis court. Bedern Passage tucked between shops in the busy shopping district of Goodram Gate, leads to another of York's hidden medieval treasures. Crossing York via its passages, snickelways and ginnels is a way of experiencing the silence of the past in the midst of a bustling, modern city. This opening, between a Mind charity shop and Caesar's Italian Restaurant at 29 Goodramgate, looks like a delivery entrance for the modern, commercial city center. It's not. Come through the ginnel known as Bedern Passage and you are on Bedern Path beside the ancient remains of Bedern Chapel. The chapel and the nearby hall are all that remains of the College of the Vicars Choral of the Minster. It was consecrated in 1349. Bedern Hall, the "common hall" of the college is nearby. It was originally used as a refectory or dining hall for the choral. Today, in the spirit of its origins, it can be hired for weddings, private parties and meetings. During the summer, it hosts teas that are open to the public. .
Look for Mark W. Jones's wonderful little book, A Walk Around the Snickelways. It's out of print but used copies are available.